This is the best view most people will have of a snake. 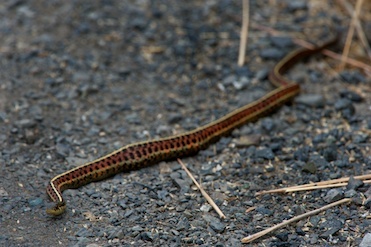 Here a coast garter snake basks on a trail after a recent meal. Upon approach of people this snake will quickly disappear into the brush. For many people nothing strikes fear like the sight of a snake. For some it’s not just a startle but a gasping for breath, clutch the chest, sweating fear. Fear of snakes, ophidiophobia, is frequently listed as one of the top fears, even over death. One of the lofty goals of this site is to get people to have a greater appreciation of these animals and hopefully diminish any fears or disgust someone might have. For many people that have had limited contact with snakes, their encounter is likely with a garter snake. Garter snakes are so named due to their striped and checkered bodies, vaguely resembling the undergarment of days past. In some regions they are called ribbon snakes for their slender striped bodies. They are also often misnamed gardener snakes, likely for their common distribution and garden sightings. Garter snakes fall within the genus Thamnophis and contains somewhere near 30 species. They cover most of North America and are one of the most northern species of snake reaching in to Canada and are the only snake found in Alaska. Garter snakes are a difficult group in that there is lots of intraspecific variation – that is different populations can look very different from each other or even individuals from the same population can look very different. Many species within the genus strongly resemble each other and there is a degree of disagreement amongst experts about how many species there are and even more regarding the status of sub-species. Currently about 30 species of Thamnophis are classified and numerous sub-species with lots of taxonomic fluctuation currently exist. Garters are considered generalist feeders and are known to eat frogs, tadpoles, fish, salamanders and newts, invertebrates, small rodents; just about anything they come across. They are usually associated in or near waterways, especially in the western US. California currently has eight species with numerous sub-species. Some of those are endangered, restricted in range, or uniquely patterned while others are widespread and variable to the point of confusion. Identifying species can be quite the challenge. Usually experience, geography, and color patterns can accurately nail down the species but that most delightful of herpetologists’ chores – scale counts – is needed to really differentiate the species; especially in areas where species overlap. This means that the snakes need to be caught. Most people fear being bitten by snakes but that is the least concern with Thamnophis. Garter snakes were originally thought to be non-venomous but recent studies indicate that these snakes can be venomous but in levels toxic only to their small prey. While some individuals seem prone to bite I have found that more often they don’t. When they do there is no pain as their teeth are quite short leaving tiny pin prick marks with a little bit of blood for added drama. The bigger concern with Thamnophis is for their foul smelling excretions they emit as an anti-predator defense. It is a musky odor mixed with their waste that the snake smears around while writhing in your hand that leaves a lasting impression. On the bright side it is a constant reminder of your snake catching success as you continue on your day. I’m truly impressed and enjoying your new site. Looking forward to extended education in viewing amphibios. Came across a beautiful little red checkered garter snake along the ridge between Tomales Bay and McClure Beach near Point Reyes. No red head, more like blackish and no sky blue dorsal stripe, does this sound like the more common T. elegans? I’ve long been a fan of garters, but had normally enountered them closely associated with fresh water, which in this case was about a km away, in the form of tule marsh along the bay shoreline. Are these guys more terrestrial than common garters? Maybe feeding more on mole crickets and juvenile mice than tadpoles and tree frogs? Brenden, I would say you saw the terrestrial garter, T. elegans. T. sirtalis is less common (despite the name) in our area. Both species have a huge overlap in habitat and diet preference. 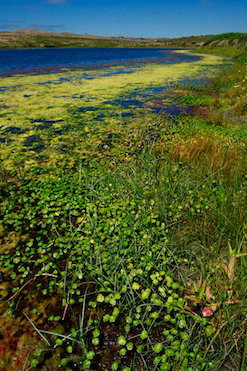 In our area T. sirtalis tends to be more associated with waterways; ponds especially. And they tend to favor frogs and fish more, but will take small mammals and the occasional invert I’m sure. Both these species will eat just about anything they can get their mouths around. Which is one of the reasons they are so widespread. Saw a large brillant blue sided garter on trail at Abbott’s Lagoon March 26 about 5:30 PM. Never seen one that large – at least a yard long. Very nice. The big ones aren’t seen very often but they are out there. My recent outing to Abbott’s has only produced T. atratus and T. elegans. Most of the time they are missed because they are usually aware of us before we are of them. And they can move quickly and silently away before we get a chance to see them.